It’s important for expectant mommas to build and maintain a strong lower body during pregnancy because it will help support the pelvis and spine through daily activities as her body weight increases. Climbing the stairs, chasing a toddler around, or walking to work requires a fit and stable mom-to-be. However, there’s more to a fit mom’s body than strong glutes. As I chatted about in a previous post, Top 3 Exercises to Strengthen Core Muscles During Pregnancy, strength training during pregnancy can significantly support your posture and alignment. Good posture is important for decreasing pregnancy aches and pains, allowing baby to grow in an optimal position, and having a smooth labor and delivery. Lower body muscles, especially the glutes, should be focused on throughout your pregnancy training —and postnatal too! 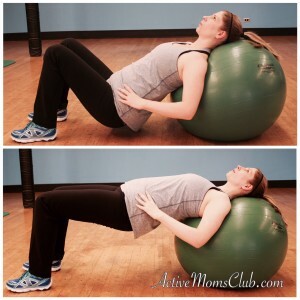 This is one of my favorite exercises for any stage of pregnancy to engage glutes, hamstrings —posterior muscles — and loads of deep abdominal muscle activation. Begin with a pelvic tilt, bringing your ribcage toward your pelvis. Raise the hips up so you have a straight line from your knees to shoulders, by squeezing your glutes as tight as you can. Lower the hips down towards the floor, and repeat 10 – 15 times. Note: Be careful not to hyper-extend your lower back in this position. Think about keeping your ribcage and your pelvis tucked towards one another the entire time – the pelvic tilt will help this. I love the wall sit for many reasons. It a great exercise to ‘turn-on’ lower body muscles – both glutes and hamstrings, especially if you tend to sit most of your day at work. It also is an effective position to push the body back into alignment, and with arms up against the wall (shown in picture) it provides a much needed stretch for chest muscles (which tend to get really tight on expecting and new moms due to rounded shoulders). Place feet 15-18” away from wall and slide yourself down so that your knees are almost parallel to the floor, with hips slightly higher than knees. If needed, adjust feet further away from wall so that your knees are at 90º or greater. See image. Pelvic tilt your hips to push lower back into wall. Push your weight through heels (rather than through your toes). Lift arms up and place elbows, forearms, and hands against wall. This may be difficultIf if chest muscles are tight, do the best you can, maybe just the hands/fingertips initial touch wall. Sit in this position for upwards to 60 seconds. Step-ups are fantastic for glute activation, balance, and single leg stability. You can begin practicing this exercise by using a shorter step, and for more advanced exercisers, raise the difficulty level by increasing height of step, and/or loading it will dumbbells or a medicine ball. Place right foot on top of step. Press firmly through right heel to lift yourself to standing position on top of step. Be sure to complete movement at the top by standing erect through torso, and engage abdominals — give your baby a hug! With control, slowly lower left foot back to floor, landing 15-18” away from step. The longer, controlled step back to floor will recruit more glute (posterior) muscles. Keep right foot on top of the step the whole time. Repeat step up with right leg 8-15 times. Then switch sides and repeat 8-15 reps with left leg. There you have it! Three of our favorite lower body exercises to perform during pregnancy. Oh, and they’re great for non-pregnant mommas too! Give yourself and your baby every advantage of prenatal exercise. 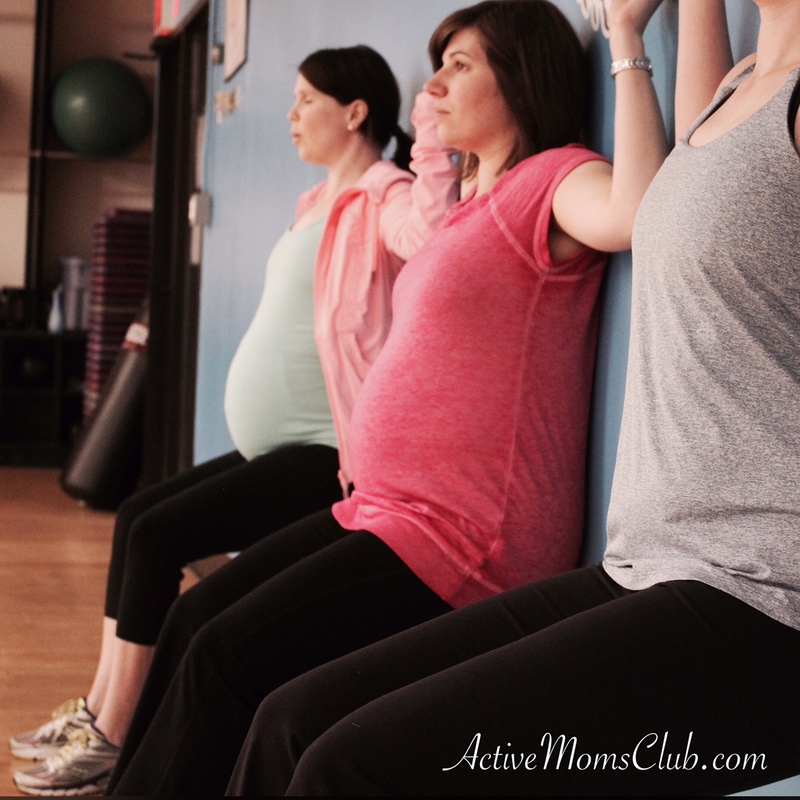 Let AMC help you navigate the do’s & dont’s of prenatal exercise. Our Small Group Prenatal Fitness program is more than a class – it is personalized training in a small group setting. Visit our website to learn more and to get started. We have brand new prenatal packages for classes in 2017.